The Local Food Report can be heard every Thursday morning at 8:45am and afternoon at 5:45pm, and Saturday morning at 9:35. An avid locavore, Elspeth Hay lives in Wellfleet and writes a blog about food, Diary of a Locavore. Elspeth is constantly exploring the Cape, Islands, and South Coast and all our farmer's markets to find out what's good, what's growing and what to do with it. Ali Berlow lives on Martha's Vineyard and is the author of "The Food Activist Handbook; Big & Small Things You Can Do to Help Provide Fresh, Healthy Food for Your Community." Foreword by Alice Randall, Storey Publishing. You can reach her at her website, aliberlow.com. The Local Food Report is produced by Jay Allison and Viki Merrick of Atlantic Public Media. The Local Food Report is made possible by the support of the Local Food Chain. Zucchini is the home gardeners' summer squash of choice. But Wellfleet farmer Victoria Pecoraro prefers varieties that stay small. 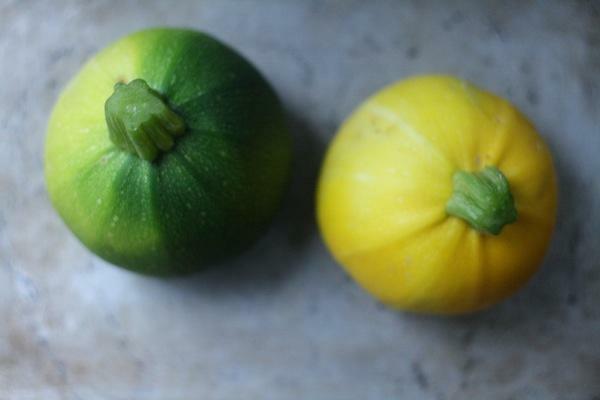 This week on the Local Food Report, Elspeth talks with Victoria about three round summer squash varieties the size of a cue ball, and gets Victoria's recipe for Zucchini Parmesan. You can find the recipe on Elspeth's blog about local food, Diary of a Locavore. Elinor Arsenault grew up baking in the small town of Royalton, Massachusetts, where a good portion of the population was Finnish. This week on the Local Food Report, Elinor shares her Finnish-inspired recipe for a traditional raspberry shortbread made with raspberry jam from her own Orleans-grown berries. 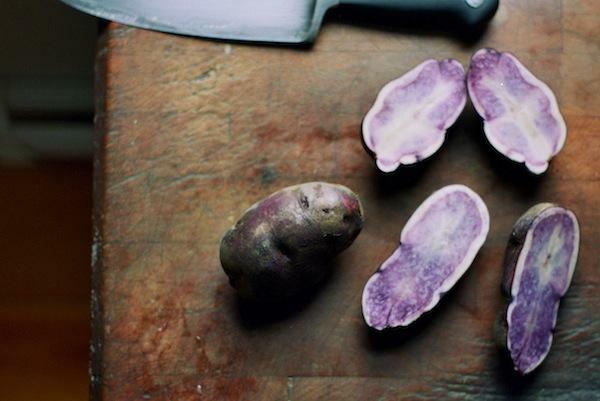 Potatoes come in many shapes, colors and sizes. This week on the Local Food Report, Elspeth Hay talks with Truro farmer Stephanie Rein who's growing two unusual varieties. She also gets an update on the growing conditions and this season's harvest, and learns about potato pests. Click here for Elspeth's recipe for Pesto Potato Salad. Can Local Dogfish Save the Fleet? Atlantic Spiny Dogfish is abundant. But it's not in demand locally, and because of over-fishing in Europe, the overseas market is crashing. This week on The Local Food Report, Elspeth Hay talks with local dogfisherman Leo Maher about efforts to create a market for this small edible shark on the Cape. Some like it hot...and some like it super-hot. Rooster Fricke grows over 200 pounds of the world's hottest chili peppers every year in his Woods Hole garden. This week on The Local Food Report, he shares his recipe for "Rocket Fuel," a super-spicy hot sauce. Click here to go to the recipe. You can also read more on Elspeth Hay's blog, Diary of a Locavore. Chili peppers aren't native to the Cape. They do best in hot climates, and archeologists believe they were first domesticated in Ecuador. But this week on the Local Food Report, Elspeth Hay talks with a Woods Hole gardener who grows chili plants year-round. It's the first in a three-part series on local chili peppers. You can find a recipe for chili pepper salad dressing on Elspeth's blog, Diary of a Locavore. Until about a decade ago, there weren't many local shellfishermen bringing razor clams to market. They're hard to harvest with a rake—the shells are paper-thin and break easily, and they're fast—they can easily out-dig a clammer's hand. But then a method called salting came over from Ireland. On this week's Local Food Report, Elspeth Hay learns about salting and the razor clam market from Ron Brunelle of Eastham. 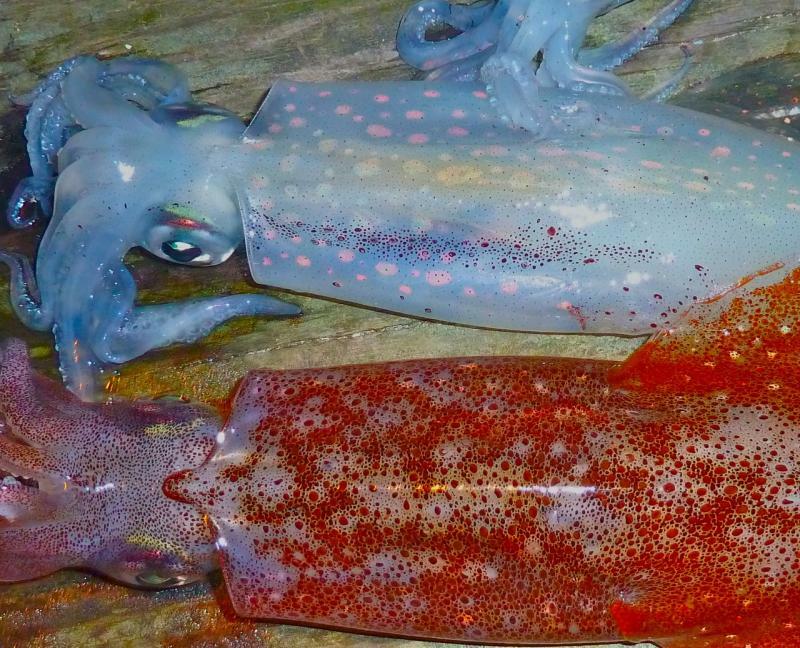 It's been a slow squid season this year, so why not use all of what you catch? This week on The Local Food Report, Elspeth Hay learns about the many culinary uses of squid ink, from risottos to martinis. Get detailed instructions (with photos) for cleaning squid, and a recipe for Risotto Nero alla Fiorentino on Elspeth's blog, Diary of a Locavore. Local Food Report audio posted above. Most cooks have heard of broccoli rabe. But what about other rabe varieties? 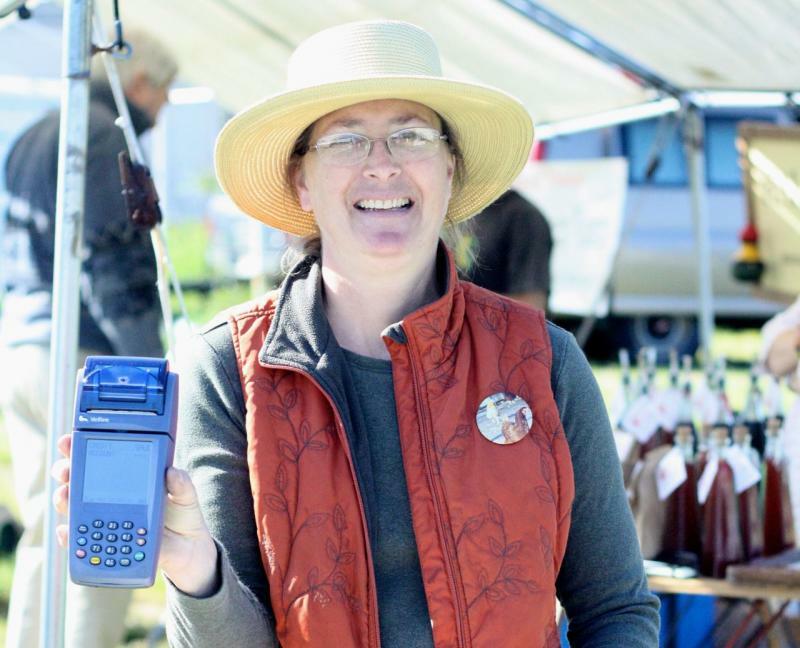 This week on The Local Food Report, Elspeth Hay talks with growers at the Orleans Farmers' Market about this spring delicacy from the Brassica family. Every year low-income Massachusetts residents receive $1.2 billion to help buy food. On the Local Food Report, Elspeth Hay examines the program called SNAP, or the Supplemental Nutrition Assistance Program. Until recently, the money was given out as food stamps—physical, tangible pieces of paper. But in the late 90s, SNAP went electronic. Most people think of stinging nettles as an obnoxious—and painful—weed. But this week on the Local Food Report, Falmouth resident Fiamma Straneo takes Elspeth foraging for stinging nettles and remembers nettle recipes from her childhood in Italy. You can read more about nettles on Elspeth's blog, Diary of a Locavore. Under a canopy of tall hardwoods in Truro, there grows a small forest of Cinnamon ferns. On the Local Food Report, Elspeth Hay harvests these edible local greens - a springtime ritual - with forager Charlie Grimm. 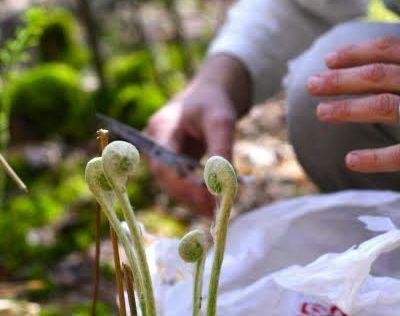 Find out more and get Charlie Grimm's recipe for preparing Cinnamon ferns. This episode of the Local Food Report is a rebroadcast of one that originally aired on May 19, 2011. Temperature is important, and so is humidity, when incubating eggs. 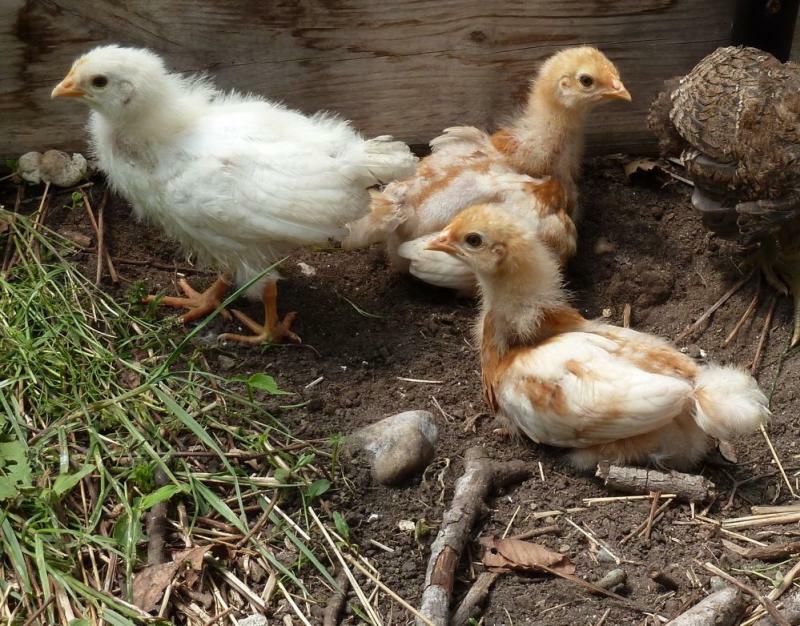 On the Local Food Report, Elspeth Hay speaks with Susan Knieriem of Miss Scarlett's Blue Ribbon Farm in Yarmouthport about raising chickens from egg to bird. Susan does it using an old-fashioned incubator—it looks like an old wooden icebox, and it holds about 100 eggs. She collects the fertile ones—which is most of them since she's got roosters—and dates them and lays them on the trays. After 21 days: peep. Peep. PEEP. PEEP! Babies. Spelt is an ancient grain—a hybrid of regular bread wheat and another wheat variety called farro or emmer. 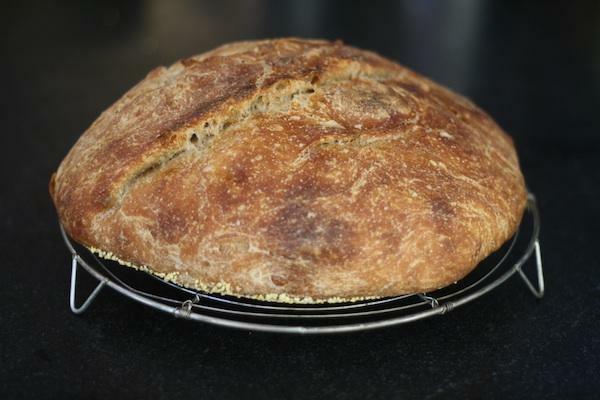 On the Local Food Report, Elspeth Hay talks with Ed Miller of Wellfleet about a slow-rise spelt bread made with locally grown grain. Read more on Elspeth's blog, Diary of a Locavore.